This weekend has been SUCH A BLAST!!! My parents came up Friday, and we all went out with Sam's parents for dinner. After dinner, my parents and I went to Michaels because Sam also gave me a coupon which was only good through Saturday. I bought myself the One Skein Wonder book! It has some beautiful lace shawl and scarf projects. Saturday morning, I headed to meet up with my parents and we went to the Sedalia Fiber Festival!! I won't describe each and every picture, you can probably figure out mostly what's going on. When we first arrived, we saw NAMASTE BAGS!! It was cloudy, I thought the mountains looked beautiful half-hidden by the clouds. I was very good. I only bought 2 skeins of yarn. Pretty silk yarn. I'm debating between a hat and a scarf... its 110 yards. Skein of pretty sock yarn! My super awesome Knitting Group friends had a big surprise for me! When I first got there, Dianne sang Happy Birthday to me over the loudspeaker! Then, later on they called me over and wished me Happy Birthday again, and gave me a beautiful gift. Knowing that I'd hoped to buy some Socks that Rock at the festival, but that no vendor was going to have some, they ordered me a skein!! They also had Nana Sadie Rose custom make me this beautiful WIP Bag. AND to top all that off, Dana made cupcakes!!! AND!!! Then they made me wear a tiara!!! I bought myself a really neat Mayan Spinner, which is kind of like a drop spindle, except instead of dropping it you hold it in your had and whirl it around like a noisemaker. This makes it much easier to use with cats around, or even in the car! I can't wait to try it. Afterwards, Mom and I went to the Yellow Submarine for lunch while my Dad, sister, and grandmother went to the Monacan Pow-Wow. 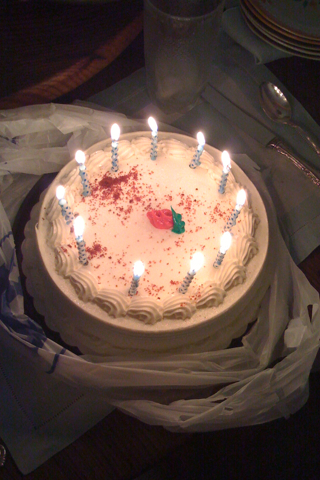 Then after dinner, we had cake!!! So whew, what a day! I'm still pooped. And YAY! Took me so long to type this that the video I took of the Alpacas finished processing. Happy Birthday! Looks like you had a fantastic day! What a lovely birthday!! Those Bedford Girls sure are wonderful!! What great shots..thanks for the awesome coverage..and planning the surprise for you was SOOO fun!..It occurred to me as I drove home from a meeting and I emailed Dana immediately..and from there..it took off!! The first clue being when you asked if we had a vendor that was going to have STR..from there it was easy going..and fun!..I didn't get to see you with your Tiara..I even wondered if it got lost in the shuffle..I'm so glad someone took charge there..
Great foot shot..hehe!!! It's my better half!! See you next Tues.. I've got to call Gina to confirm our meal.. It was a delight to make! How wonderful! It was so nice of your knit-buds to sing to you and bring you cupcakes. What a fun day!